Ayumi has extensive knowledge and experience working as a professional web designer/programmer and consultant since the year 2000. Before that, she worked as a textile designer so she has a strong background and a great flair for style, design as well as programming for the internet. She is credited with creating some ground-breaking programs, especially for real estate web use, such as madream.net. Ayumi is quite competent at building in-house systems, efficient SEO solutions, graphical user-interface designs as well as programming for web applications. Ken Nishikawa is former BBC and a TBS/MTV director. He is a filmmaker, composer, DJ, media personality, writer and translator/interpreter. Ken was partly educated in Brighton in the UK. Upon returning to Japan, Ken worked with most of major TV and radio stations in Tokyo area and has directed or produced thousands of TV shows, radio shows, music videos and commercials. Mike Rogers graduated from Loyola Marymount University in Los Angeles with a degree in Television and Communications. He has been working in the entertainment industry since 1978 and has been involved in the production of thousands of TV and radio shows as well as commercials and corporate videos. He was the first foreigner in Japan’s history to be the general manager of a major Japanese broadcasting station at TV Tokyo owned InterFM. Ayumi, Ken and Mike, who founded Robot 55 LLC., are experienced professionals in video and internet production. Between the three of us, we have over 85 years of experience. It dawns upon us that there is a fundamental problem with the way many new start-up companies think: They say the goal is to go public, raise lots of money as fast as possible, then take the money and run. Making money is good, of course. But it shouldn’t be the primary goal of your life or your company. The primary goal of life is happiness; the primary goal of the company should be something like: To make people happy; To make society a better place” or, To make life easier. A primary goal of, “making money” isn’t good because we can all make money cheating or taking advantage of people. 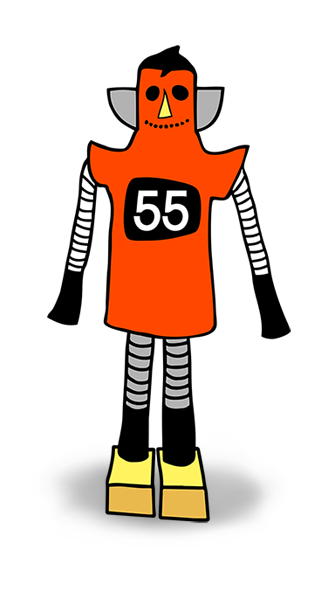 Robot 55 wants you to have fun with your business and your life. We are interested in making quality productions with quality and enthusiastic and fun people. We want to help society by hiring professionals as well as hiring the handicapped to do jobs that they can do from their own homes, thanks to the internet, and contribute to society. If you want to have fun and believe in the good things in life and your business, then let’s work together. We will also greatly discount video productions for charities and services that help people and make our world a better place to live. Send us e-mail and let’s discuss.